It was a New Year’s Eve like no other. From a night that most had planned to be a memorable one, the night turned bloody for many unfortunate ones. And this was all on account of two of Kitwe’s most notorious gangs battling for supremacy on that night. In Ndeke and other surrounding areas, a gang of teenagers called the Tokota Boys terrorises residents at night. And in Kwacha, Buchi and Kamitondo areas, another gang of teenagers calling themselves Sons of the Devil or SOD, in in charge there. 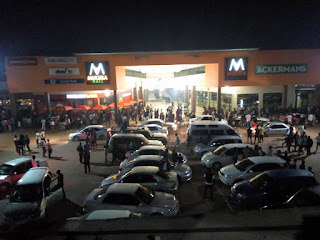 And these two gangs clashed at Mukuba Mall during the count-down to the New Year. And the result was injuries, broken down bottles and hundreds of people scampering in all directions. The Tokota Boys, who were in large numbers, possibly 30, easily fought off SOD who were less in number. The showdown only took about three minutes and after defeating the other gang, the Tokota Boys walked round the mall in celebration. The SOD disappeared for the rest of the night. Police Officers in full riot gear came on the scene 10 minutes after the situation returned to normal. This is not the first time teenage gangs are terrorising residents of Kitwe. All these years, these unemployed youths have been a nuisance. In late 2015, 16 SOD gang members were arrested and prosecuted. This was after the group went on rampage beating and killing people. The group was also suspected of having killed a security guard at one of the schools in Kamitondo. It was in this same period when Kitwe witnessed a spate of break-ins at schools were dozens of computers were stolen, leaving pupils without aides for their ICT lessons. All of them were found guilty, but because they were in examination classes, the Magistrate decided to give them suspended sentences so they could write Grade seven and nine examinations. But two years down the line, 'the Sons Of the Devil' are at it again. According to some observers, teenage gangs in Kitwe are increasing due to unemployment and abuse of alcohol and drugs. Back to New Year Eve celebrations at Mukuba Mall, teenagers took over the show, drinking and dancing the night away. It was disheartening to see teenage girls drunk and indecently dressed. Boys too were in such state, drunk and shouting unprintables. Elsewhere in Kitwe, night clubs were filled to capacity as people counted down to the New Year. In Nkana East, people were having a nice time and the menu on the table was mostly beer. But for the religious, it was a time to reflect. Saint Margaret’s Congregation of the United Church of Zambia was filled to capacity. "God cannot allow you to cross into 2018 if you have no purpose. He has a purpose for you, so be responsible in the New Year," said Reverend Freda Kamana during her sermon on that night. Whether at the night club, at Mukuba Mall or in church, Kitwe residents did not sleep until they had crossed over into 2018 in their own way. And in the end, 45 people were arrested across Kitwe on New Year’s Eve for conduct likely to cause breach of peace. "Most of the people arrested paid admission of guilty fines and have been released. Some are still being held in custody," said Copperbelt Province Police Commissioner Charity Katanga in a telephone interview.